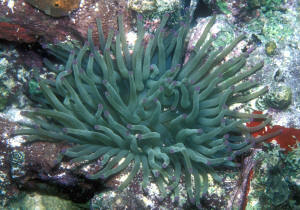 Condylactis gigantea, the Giant Anemone. Cool or cold water systems are more than just marine tanks maintained at lower temperatures. In a few substantive ways these specialty set-ups are more challenging than tropical reef systems; hence their order of presentation here. Beyond a requisite chilling mechanism, less-than-room-temperature systems require diligence in their filter arrangements, stocking and feeding. But their rewards are many; this water planet is covered and populated with far more temperate aquatic life than tropical. No, every real cold/cool water system must face trouble without cooling. Don't rely on floating "ice bags, jugs" to keep system temperature sufficiently cool. Buy or build a chiller. I have seen (and even written, a zillion years ago) how-to articles on building your own chiller; some authors showing how to retrofit a "water-cooler" compression unit, other's utilizing a heat-exchange coil of vinyl or butyl tubing entering and exiting a conventional refrigerator. My favorite was the use of an emersion coil looped within an old chest-type soda vending machine. Be very careful of contamination if you choose to "build your own". Modern units come in two formats, either with a chilled coil you immerse in your system, or an external exchanger with a transfer fluid that the system's water is re-circulated through. What's that Latin saying? "Cave aquaristum", let the aquarist beware; there is a very wide range of quality, functionality and life-span amongst available units. By all means, compare warranties/guarantees, but do not purchase a unit until you've spoken with people (plural) who have used them. Some of these units are plain garbage, not "pulling down" anywhere near what their manufacturer's claim, leaking, failing, going to fish-heaven in less than a year. There are reputable people in the trade, and a few more units on their way, thank goodness, that will hopefully oust the charlatans. Placement of chillers is critical; they should be where you can reach them for cleaning and checking, but also positioned for thorough ventilation and no water contact/splashing. Doing what you can to thermally insulate the system, plumbing, sumps, etc. will pay big dividends in temperature fluctuation and chilling costs. You can buy wrapping for the plumbing and adhere Styrofoam sheet on all tank sides that aren't viewed through. Dedicated cool systems can be procured that have double-pane panels, fiberglass and foam. Acrylic aquariums are far more heat-resisting than glass. A super hot day, power or chiller failure? Turn your lights off, leave the cover askew, crank up the aeration... and possibly float ice bags or water frozen in plastic containers in the system. For emergencies and lowering the average-kinetic-energy (temperature) for water changes only. System installation is identical for cold water as it has been for all other types of marine set-ups so far, with the following notes on lighting and filtration/establishing nutrient cycling. Though intensity is not as much an issue for cooler water systems compared to tropical, light quality is. You are especially encouraged not to cheat yourself out of the wonder and beauty of cultivating the micro and macro-algae that grow in cooler water. Utilize full-spectrum fluorescents on a timer as detailed before. Due to the abundance and size of livestock and copious feeding, a "reef" filter system is encouraged. I have witnessed many set-ups that "got-along" with only an air or power-head driven under-gravel filter system, but I wouldn't go this route. True, the metabolism of all your livestock is greatly slowed at reduced temperature, but so is biological cycling. Use a vigorous power filter and protein skimmer. Establishing nutrient cycling in cold water can be a long and arduous process; but not necessarily. My advice is to not start cooling the system until after beneficial microbes have become situated; then to lower it slowly, a degree or two per day. At this point you can safely install your first cool water livestock. Should be done more frequently and with larger volumes, a minimum of twenty five percent change out per month. I don't know why cold water systems seem to suffer more from this type of toxicity more than tropical, but aquarists seem to introduce metal; contaminants in decor, substrate, thermometers, and especially "heat exchangers" in cold water systems a lot. Keep water shielded and away from your chiller. If you touch anything around your mechanicals and controllers, keep your darned hands out of the system. Emphatic enough? May be collected (check with local law/Fish and Game re licensing/restrictions) or purchased direct from dealers or mail order. Acclimation is ideally the same as for tropicals; dips/baths at least, quarantine at best. Beware of fast changes in temperature, anything more than 5 degrees F. in collecting, moving temperate livestock. Biological disease is rarely a problem with cooler water systems. Once again, degrading environmental conditions are generally the root cause of difficulties. Isolation and treatment in a separate system, not the main. There are several very different, and exciting, kinds of cold water marine environments, rocky shore, mud flat, varying tidal environments, each with distinctively different mixes of life. By all means please read my favorite "text", Thomas Niesen's Marine Biology Coloring Book, if you intend to try a cold water system. I've used this wonderful color-in-by-the-numbers book for high school to university instruction to teach local (California) near-shore marine biology. California Reef Specialists, 740 Tioga Ave., Sand City, CA 93955, 408-394-7271 produce a handy, informative newsletter on temperate reefs as well as supplying cold water organisms and "live-rock". They have David Wrobel's excellent "cool" booklets too. Burggren, Warren W. 1972. An inexpensive cold water aquarium. Marine Aquarist 3(2):72.